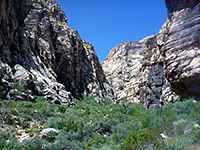 Half a dozen deep ravines cut into the west face of the Spring Mountains in Red Rock Canyon NCA, and most have a trail running part of the way through, generally just the very lowest part, since all are blocked by dryfalls and a full descent is only possible if starting from the top, and using ropes. 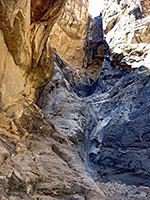 One ravine popular during the hotter weather that predominates much of the year is Icebox Canyon, which has especially dark, sheer walls, creating a cool microclimate where temperatures can be up to 20°F less than the surroundings. Seasonal streams form transient waterfalls and leave residual pools that remain all through summer, helping to sustain a variety of trees and bushes, mixed with the usual Mojave Desert yucca and cacti found all across the park. 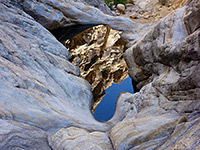 The Icebox Canyon Trail crosses open flats for 0.7 miles then follows the boulder-filled streambed for another half mile, ending at a junction in the ravine, where both forks are soon blocked by dryfalls. The round trip hike to this point takes just an hour or so, and makes a good contrast with the open terrain of the Calico Hills, the other main hiking location in the park. Red Rock Canyon NCA map. The trailhead, and canyon overlook, are along the one-way scenic drive, 7.5 miles from the visitor center; there is plenty of parking available, on both sides of the road. The ravine is clearly visible to the west, and the path sets off directly towards the mountains, first descending a little, crossing the wide, dry streambed of Red Rock Wash and starting a slow, steady ascent across the bushy, rocky slopes leading to the canyon. En route is an intersection with the Dale's and SMYC components of the Escarpment Trail, which runs all along the base of the mountains. Desert plants in this region include echinocereus, buckhorn cholla, two types of yucca (banana and Mojave) and two types of padded opuntia, plus pinyon-juniper trees and a sprinkling of wildflowers. The boulders get bigger as the entrance to the ravine approaches, and the gradient steepens, before the path drops down into the dry wash emerging from the canyon. Sheer walls rise up abruptly on both sides - whitish sandstone but stained brown or black in most places, so that the overall environment is rather gloomy; this is not a particularly pretty canyon, but it does have a good variety of eroded formations. The remainder of the hike involves scrambling up the drainage, over or around several huge boulders and small pour-offs, but there are no difficult obstacles. At the fork in the canyon, the south branch soon gains over 100 feet via a water-polished slickrock slope of grey/black rock containing several potholes, and a big dryfall, beneath an overhanging, desert-varnish-streaked alcove; quite a photogenic site. The north branch slopes up a little way further to the base of a smaller but still unclimbable dryfall, surrounded by brownish rocks. 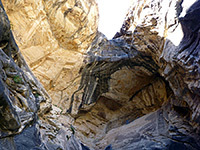 A rope may be fixed to one side, to aid groups descending from above.